Our team from Cho Oyu has made their way back safely to Kathmandu and we now turn our attention to the upcoming November 4 expedition on Ama Dablam and the many trips to come in the year ahead! Our Cho Oyu team did not manage any summit this trip but they gave it every chance possible! Even after many teams packed it up and went home we stuck around in the hopes of a good change in the weather which alas never came. The determination and persistence our team showed was amazing given the very difficult weather and conditions. Seems our crew continued to have fun the whole way and not lose sight of the fact that to climb an 8000m peak one must expect some lousy weather and down time in BC. We look forward to heading back to Cho Oyu next spring and hope you'll join us! Ama Dablam - our 6th straight year! 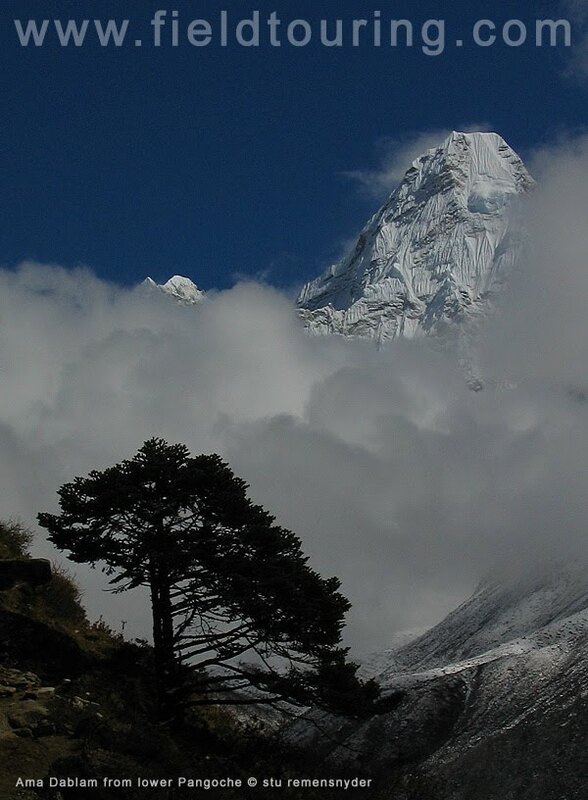 Our upcoming expedition to Ama Dablam is quite different with casual strolls along ancient trade routes and amid pungent rhododendron forests and autumn harvests. They'll be eating apple pie and pizza, sipping capuccinos and enjoying one of the great treks in the world from Lukla to Ama Dablam BC (and for most on to Everest BC after the climb). If the weather socks in a bit our team can pop into a tea house less than an hour from bc for popcorn and beers and recharge their cell phones. With shops all the way from Lukla to Chukung they can pick up fresh snacks and hot teas as they go and even grab a few hot showers along the way. Our BC set up at Ama Dablam is on a grassy field with a stream running down the middle. While a bit bumpy for a game of football, it is nonetheless a far cry from the moving glacier BC of Broad Peak, or the very rocky and steep slope of the Cho Oyu base camp. This will be our 6th year on the hill and we have a confirmed Nov 4 trip and are already taking signup for next spring and autumn! Zangrilli - Busiest guide in 2010? I am sure that Fabrizio will enjoy a change after nearly 6 months which have included Makalu, Broad Peak, K2 and Cho Oyu. I am sure it would be hard to find a guide who has strung together guiding 4 8000m peaks in less than 6 months and we are glad that he is off enjoying a well earned 3 week vacation! He'll come back to guide Ama Dablam and then head off to Aconcagua to guide the Polish Glacier (Dec 18 start) and then the False Polish Climb (Jan 10 start) before heading home for steep ice in Colorado! Ahead later in the year will hopefully be a return for Fabrizio to Makalu, a summer on Nanga Parbat and possibly a return visit to K2! Rematches with 8000 and 7000m peaks? 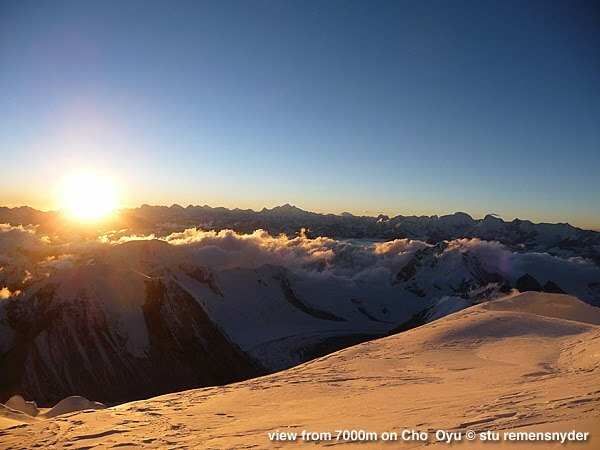 Chris has had abusy year as well with Cho Oyu, Broad Peak and K2 and still has Aconcagua ahead in February! He'll be back in Nepal in the spring likley for Cholatse or Ama Dablam and then back to Pakistan for Broad Peak & possibly Spantik. After that he'll be off to India for a second trip to Satopanth! He will also likley be leading a new trip to either Stok Kangri (august) or a High Peaks Traverse in the Khumbu (oct). We are already taking signups for Broad Peak and Satopanth with Chris Szymiec and looking forward to a return to both peaks under his leadership! Many of our guides are already confirmed on upcoming trips so join your favorite guide - Ben is set for Aconcagua and Tharpu Chuli, Chris for Broad Peak and Satopanth, Fabrizio for Ama Dablam, Aconcagua and Nanga Parbat, Brad for Ecuador, Sean for Kili and G2, Stu & Matt for Denali and more trips confirming all the time! We have an exciting year ahead and hope you'll join us! Fabrizio called in from BC to let us know that all is well and that the conditions on the mountain were simply to dangerous to proceed. They advanced to C1 2 days ago and after beginning towards C2 yesterday the winds were very severe and it was a great effort just to come back down safely. Fabrizio did manage to make his way to C2 to clear the tents in 30km/hr winds and very cold temps. He said it took a good 45minutes to hack out the tents and he was pretty cold by the time he was done. He noted that Santiago was back from his first attempt and staying up for a second attempt and we wish Santiago safe passage! Our team now all at BC and awaiting the arrival of the yaks on the 9th. We'll have updates on their progress out to Kathmandu and look forward to a full report on the climb and lots of good pics when they are back. Thanks for following along on Cho Oyu and please rejoin us in early November for our Island Peak and Ama Dablam expeditions. We do still have a few spaces available for trekkers to join us to go on to Everest BC and for climbers on island Peak and Ama Dablam! Drop a note to "info@fieldtouring.com" and let us know or visit the site at www.fieldtouring.com for more trip info! Fabrizio checked in from ABC to let us know that all is well and that the team will head up tomorrow to C1 with hopes of summiting on the 8th or 9th if the winds will allow! Our team was having considerable snowfall during the day today and the winds, even at BC, were very strong. They had hoped to move up to C1 today but with such difficult conditions they opted to hold off a day. The present plan is for our team will to C1 on the 6th, C2 on the 7th and then, depending on the wind at that time, to go for the top on the 8th from C2 or from C3 on the 9th. The reports are not very promising at this time for winds to be sufficiently low to make a bid but our team remains hopeful! At least 2 other teams have a similar plan and we'll hope that working together they will be able to make a good summit bid. 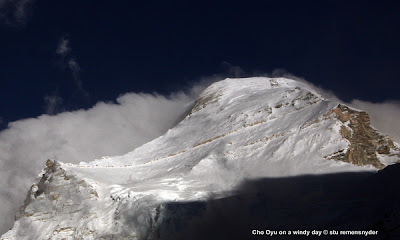 The yaks arrive soon so this will be our last effort for 2010 on Cho Oyu. Wish our team luck! According to Fabrizio a few other climbers are high up now and are catching very heavy winds. These climbers there now are hoping for the calmer winds expected on the 6th to materialize. We'll know more in the next 24 hours about their progress and it will help our team to fine tune their plan. 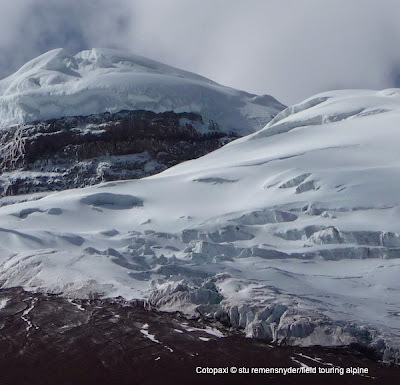 Included in the groups of climbers higher on the hill is Santiago Quintero from Ecuador. 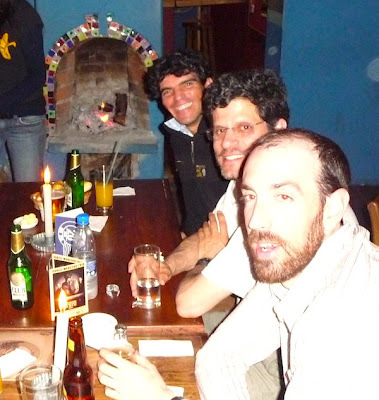 Last February one of our Ecuador Volcanoes groups enjoyed an evening with Santiago and he showed our members some amazing local food and music spots. He was a gracious host and piled 5 of us in his car to get us around the busy city of Quito! We enjoyed our time with him and wish him luck on his summit bid! We had a fabulous dinner with Santiago (on L in pic above) at the restaurant "El Pobre Diablo" and not only was the food great and ambiance wonderful but they had a surprise int he back room. 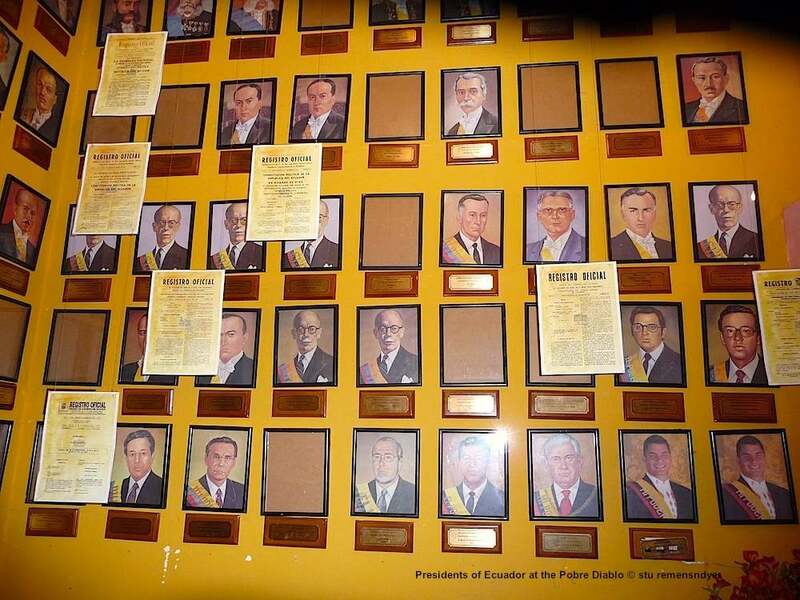 In this room they had every president of Ecuador on a wall with their times in office. 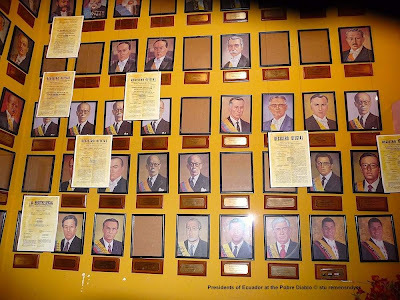 Ecuador has a storied past when it comes to leaders remaining in office for brief periods of time and we scoured the wall for the shortest - a single day! 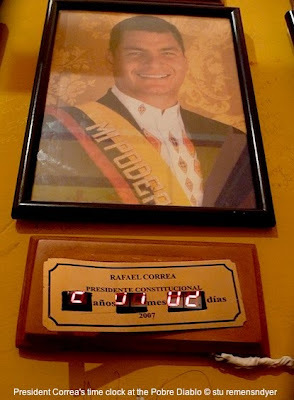 As well the plaque of the current president Correa has a digital clock under his name. When we were they it read more than 2 years which is a long time for an Ecuadorian president. In the last week there was a quasi-coup attempt in Quito and his clock was in peril of being stopped for a very serious few hours. Correa's day began with confronting an angry group of police officers, progressed to being held captive for more than 10 hours and ended with his extraction by an elite special forces squad. When the day was done there were many hundreds injured in the protest and at least 5 people killed during the extraction. The situation has now settled down but the fallout may continue for some time as arrests are ongoing in connection with the uprising and standoff. We'll all be watching carefully to see how this standoff plays out in political power and the future of Ecuador. It certainly seems that the resolution has been unlike what might have happened a number of years ago when the military might have just taken over. In this case the military clearly supported the power of the elected president and the democratic system in general. As the NY Times noted: "Lessons for Ecuador's fragile democracy seem to be emerging, albeit haltingly." When our teams arrive in Ecuador for the upcoming season of climbing on the volcanoes I am sure this will still be a topic of discussion with our local guides and staff and a very interesting time to be in Ecuador. Our lead guides for our confirmed Jan 5 trip, Brad Boehringer and Nacho Espinoza (from Ecuador), will be sure to help you understand more about how this standoff has impacted on life in Ecuador by the time another 3 months has come to pass. When Fabrizio has come off of Cho Oyu he will take a well deserved 2 week rest in Nepal and then head off to Ama Dablam to lead our team there. We still have a few spaces left for our 6th year in a row on the hill and 9th trip overall. He'll be joined by our lead Sherpa Siddhi (who is on Cho Oyu now!) 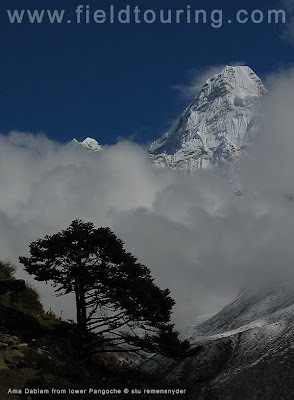 and together they will lead the team to Island Peak and the Ama Dablam. We look forward to a great trip and hope you'll follow along when we start on the 4th of November! FTA Cho Oyu 2010 – Team in C2 and all is well! Fabrizio called in from C2 to let us know that all is well! He and Luis and Siddhi and Gordon are enjoying a zero wind afternoon at 7000m and enjoying a last acclimatization run. In the morning they will amble up the slopes a bit (wind permitting) and then drop back to bc to rest. There are reports of good windows possible in the Oct 6 to Oct 10 period and we'll hope one of those strengthens in the days ahead. They have yaks planned for the 11th so can consider a bid on the 9th and perhaps even the 10th. Fabrizio reported that one german climber has returned from the top today and that another group is staged in c3 and going for the top tonight. The one summiteer did report continued dangerous conditions but the fact that he was able to go through to the plateau bodes well for out team in a few days! In the next few days we'll be watching the weather carefully and making a summit bid plan. It is exciting to have the possibility of the summit open up again after a very difficult stretch. No doubt that patience remains a key in 8000m climbing and seems our team has a healthy dose of it in their systems! Fabrizio has left an audio dispatch from 7000m - enjoy!